They’ve been doing their thing for over 130 years! 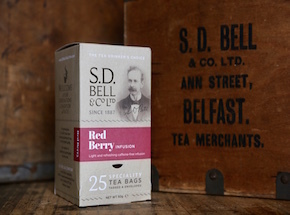 What started off as a general store and hardware business down in Belfast City Centre in 1887 remains Ireland’s oldest independent Tea Importer and Coffee Roaster. Robert represents the fourth generation of the Bell family to carry on the trade. Check out www.sdbellsteacoffee.com/events for details of live music events. Their Sunday Java Jive Jazz Brunch is always popular, and it’s wise to book, by phone or online. The Leaf & Berry is also available as a venue for private functions. It is too long to mention. There are more than 30 coffees and dozens of tea bags and teas of every conceivable blend.